What is a martial art? In Roman mythology, Mars is the god of war so any fighting art (or war art) was known to European culture as a martial art (or "art of Mars"). To be very general, most European-sourced fighting styles tend to be closed-handed (fist) while many Asian-sourced fighting styles tend to be open-handed or mixed. There are many Martial Arts but this webpage follows one thread of Asian martial arts as it flowed from India, to China, to Okinawa, to Japan, to America, then finally to Canada. Japanese Karate is 100% hard; Chinese Kung Fu and Wushu are 100% soft; and Japanese Goju is 50% hard so what do these terms mean? remember Mr. Miyagi from the 1984 move The Karate Kid ? This name was not a coincidence. caveat: Eastern Asian names are almost always presented "surname first"
Funakoshi Gichin introduces Okinawan Karate to Japan in 1922 where it is formalized then developed. Peter Urban (who trained in Japan under Sensei Richard Kim and Gogen Yamaguchi in the 1950s) is not successful in obtaining permission from Yamaguchi to start American Goju-Ryu but does so anyway. Te practitioners journeyed to China (Fuchow was an Okinawan settlement in those days) to learn various Chinese martial arts including Kempo, Kung Fu, Wushu, etc. The merged styles were brought back to Okinawa which later migrated to Japan where they are formalized and standardized. Okinawa is the name of the largest island in the chain of Ryukyu islands running between Japan and Taiwan. Although the people of Okinawa were genetically and culturally linked to the people of Japan, Okinawa was considered a tribute state of China. By 1372 trading relations between Okinawa and China had already existed for several hundred years. That year something which would have an enormous impact on not only the development of Okinawa Te but also on the history of Okinawa itself happened. The Emperor of Okinawa Satto voluntarily agreed to become a vassal of China. Under Chinese laws of that time, goods produced in countries belonging to China's protectorate were not liable to customs taxes. China was obliged to, in case of war, defend countries under its protectorate. A delegation of Okinawans signed the agreement in Peking with the Emperor Hang Wu Thai (Ming Dynasty). In 1393 an event called "Sanye Roku Sei" - "Thirty-six families" took place. A large group of Chinese settlers founded on Okinawa the village Kume Mupai not far from the city of Naha. The expression "Thirty-six" doesn't signify the number of settlers, but rather in the 15th century this Chinese character meant a large group of people. They had not come to wage war. Some of them were artists, craftsmen, and seafarers. They taught the Okinawans Chinese writing, education, and arts. Among them was also large group Tsuan Fa masters (Chinese Martial Art). Young people were more than happy to start learning a new type of martial art. It was right at this time that Tsuan Fa (Chinese Martial Art) and To De (Okinawan Martial Art) began to unite to create Ancient Okinawa Karate - a new martial art which had no equal. Okinawa was under Chinese protectorate for more than 200 years. Chinese Imperial Dynasties did not interfere in the internal affairs of Okinawa. This collaboration brought Okinawa a much higher level of education, economic improvement and increased trade. Okinawa sent its diplomats and high-ranking officials to study in China. The first official act of the Japanese in Okinawa was to disarm the population, shut down the Okinawa militia, and disband the Okinawa police. In 1742, Shuri-te practitioner Sakukawa Kanga (1733-1815) journeyed to China to learn Kempo. He brought this knowledge back to Okinawa in 1762. In 1865, Naha-te practitioner Higaonna Kanryo (1851-1915) visited China to learn Kung Fu. He brought this knowledge back to Okinawa in 1878. All life is precious nor can it be replaced. Grasshopper: Master, I am troubled; We learn to make powerful our bodies yet we are taught to reverence all against whom we may use such force. Master Khan: When your life is threatened, or the innocent life of another, you will be prepared to defend them. Grasshopper: Being thus prepared better than others, should I not always stand and fight? Master Khan: Ignore the insulting tongue; duck the provoking blow; run from the assault of the straw. Grasshopper: Are these not the actions of a coward? Master Khan: The wild boar runs from the tiger knowing that each being well armed by nature with deadly strength, may kill the other. Running, he saves his own life and that of the tiger. This is not cowardice, this is the love of life. future progress: Always try to increase your repetitions. don't worry if you are unable to increase your reps. You are trying to get healthy so don't hurt yourself. Our Karate club, like most, do not break boards or punch concrete blocks. In our club, senior belt students at least 18 years of age must also study Kobudo which consists of fighting with the use of Okinawan farming tools (bow, jo, sai, tonfa, nunchaku, Japanese Samurai Sword (via wooden bokken)), and Philipino Eskrima Sticks. 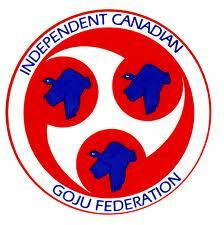 By the time I made it to Blue Belt I discovered I was becoming winded while sparing (kumite) with students half my age. To compensate, I changed my gym workouts so I had no 30-60 second pause between sets. Instead, I immediately rotate to my next set (set #1 of arms, set #1 of legs, set #1 of something else, then set #2 of arms, set #2 of legs, set #2 of something else, etc.) so that while individual muscles sets were recovering, my respiratory and circulatory systems were always busy. At the three hour mark, I was told to "rest up" by doing Tai chi (108-step Yang style) while the other student was asked to do Kobudo Kata. But this Tai chi came with a twist: this was the first time I ever did Tai chi while being periodically attacked with weapons (this grading did involve Kobudo). In fact, I was intermittently attacked by one of four armed black belts (one with a wooden dagger, one with Numchucks, one with a single Escrima stick, and one with a Tonfa). After each attack I was to continue my Taichi set at the point where I was interrupted. Yikes! No rest here! After 15 minutes of Tai chi it was my turn for Kobudo Kata and this went back and forth until the third hour was up. After a minute (which seemed much longer) my Sensei sent in a second black belt so now it was "two on one"
This went on until it was "six on one". After about a minute of this, I went down with a kick to the chest which I saw coming but was unable to block (my arms felt like they weighed a ton). At the 5.5 hour mark there was a series of verbal tests involving Karate history etc. The drive home was unusually quiet with a constant light snow fall (reminded me of Kill Bill vol2). this was a mistake and I now know that I should have lost 10-pounds because I might have been the heaviest person there. I carried that extra weight for 6 hours. I was carrying that extra weight when sparing (six-on-one) with younger, lighter opponents. I knew the grading would be 5-6 hours but never worked out more than 90 minutes. I should have spent some gym time doing light-to-medium exercises for 5-6 hours "just to feel what 6-hours was like". 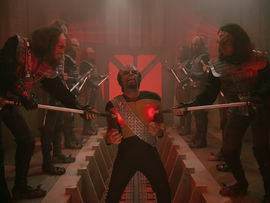 The Icarus Factor is the title of a Star Trek TNG episode which ends with Warf enduring the Klingon Second Rite of Ascension Ceremony (video) which involves torture by one's peers. I think about my Shodan Grading every time I watch that episode. Why? I did not think I was ready to do this grading but my Sensei thought otherwise. I had five months to prepare and yet at least once every week I thought about walking away from Karate. But, like Warf, I suspected I might be a better person for passing though this trial by fire. I'm glad I did.